Book Jacket: "Behind the 'Big Houses' of the antebellum South existed a different world, socially and architecturally, where slaves lived and worked. John Michael Vlach explores the structures and spaces that formed the slaves' environment. Through photographs and the words of former slaves, he portrays the plantation landscape from the slaves' own point of view. 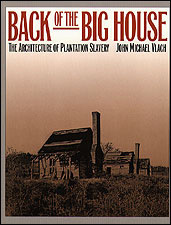 The plantation landscape was chiefly the creation of slaveholders, but Vlach argues convincingly that slaves imbued this landscape with their own meanings. Their subtle acts of appropriation constituted one of the more effective strategies of slave resistance and one that provided a locus for the formation of a distinctive African American culture in the South. Because slaves generally were not always closely supervised in the areas assigned to them. Vlach shows that they were able to create their own spaces right under the noses of their owners, spaces whose very existence undercut the slaveholders' claims of absolute control. Where the planters sited their houses and outbuildings and the types of buildings they chose to construct were decisions affected by their involvement with the institution of slavery and ultimately, by the slave themselves. Vlach has chosen more than 200 photographs and drawings from the Historic American Buildings Survey, a federal agency that has recorded structures on almost 300 sites across fourteen southern states since the 1930s. This archive has been mined many times for its images of the planters' residences but rarely for those of slave dwellings. In a dramatic photographic tour, Vlach leads readers through kitchens, smokehouses, dairies, barns and stables, and overseers' houses, finally reaching the slave quarters. At the same time that the first HABS teams were recording old buildings, representatives of the Federal Writers' Project were interviewing former slaves to record their life experiences. To evoke a firsthand sense of what it was like to live and work back of the Big House, Vlach matches excerpts from these moving testimonies to photographs and drawings of particular types of structures. Although the slave dwellings are mostly gone and the former slaves are now dead, this book transports readers back into antebellum times and provides an unprecedented view of life as a plantation slave." Taryn's Review: Working at an historic site often reminds me that refreshing my memory on topics I discuss daily is never a bad thing. I wanted to add to my knowledge of antebellum buildings that would have been on a plantation other than the main home, and a quick Google search pulled up this book. I think this is a great resource for any antebellum historic home site that interprets slavery to have in its library. While the book isn't necessarily presenting new scholarship, it is reviewing it from an incredibly important perspective that is often overlooked in the narrative of plantation histories. I really hadn't thought much about many of the other buildings that Vlach discussed, so the book served a great purpose to me and my understanding of sites where enslaved people worked. Vlach cited one of the best quotes I've ever read regarding slavery. The quote is by novelist Ralph W. Ellison and it read that "any people who could undergo such dismemberment and resuscitate itself, and endure until it could take the initiative in achieving its own freedom is obviously more than the sum of its brutalization." What a great reminder that when the discussion of slavery is brought up, it needs to be discussed also that enslaved people survived in abominable conditions yet they maintained culture, oral history, and relationships...enslaved people were so much more than the condition put upon them. We must remember this and discuss it in our narratives and interpretations. The photographs in the book are great, but a part of me would love to see a new edition put out with pictures that have been edited with new technologies that enhance the landscape and buildings. I once saw where technology helped a site take photographs of homes on the prairies and allowed the site to see into the home; previously where all was seen was a darkened window was now illuminated to see the interior of the home! Some of the floor plans could probably be made clearer as well with updated lines on some sort of software. I thoroughly appreciated this book and the way it expanded my own interpretation of plantations in the antebellum South. Definitely a great refresher for those who are well-versed on the subject, yet still important enough to keep on the bookshelf as a quick reference guide. The photographs personified the discussion, which might also be the reason the book was easier to connect with than others books on the issue. The book is a great history resource but it could also be a great read for a non-history person who has an interest in the topic.